For nearly a decade, Soriant has been able to help hundreds of hospitals overcome challenges in support services. The constant evolution of our industry requires that we stay nimble and embrace new opportunities for savings and uncover additional ways to improve the bottom line for our customers. Recently, we have been fielding an unprecedented number of requests for assistance in the vending services area, from both new and old customers, who are looking to find the best resource able to assist them appropriately. Given the need for help coupled with our expertise in this underserved area, we are making vending services a focal point and one of our core service offerings. Working with Soriant to improve your vending operations involves a short assessment where we can learn about opportunities. This step will highlight ways that your hospital can maximize sales, the use of technology and overall income. 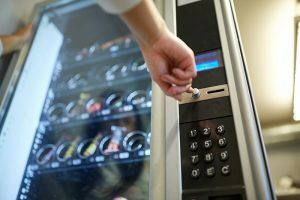 Once a plan is in place, Soriant can help you implement these improvements and realize gains in your vending operation.